"Throw them out! Throw them out!" they chanted, and stabbed thumbs down as the president passed. A hand-lettered sign, one of dozens, waved: "Somewhere in Kenya a village is missing its idiot." Steve Sweigart, a 51-year-old Charlotte information technology worker, sensed the erosion of civil liberties and the swelling size of government while George W. Bush was in office. "He said he was for smaller government," Sweigart said, "but it just didn't stop growing." And you said nothing back then. Is that because all that new bureaucracy was being built by Republicans? Goswick, 50, prides himself on being an informed, active voter. But lately, he said, elected officials don't respond to his notes and calls. "Four years ago, the TV news would make me mad, but what could one guy do about it?" he said, gesturing at the crowd. "Now look around." Here is a little more context for them. 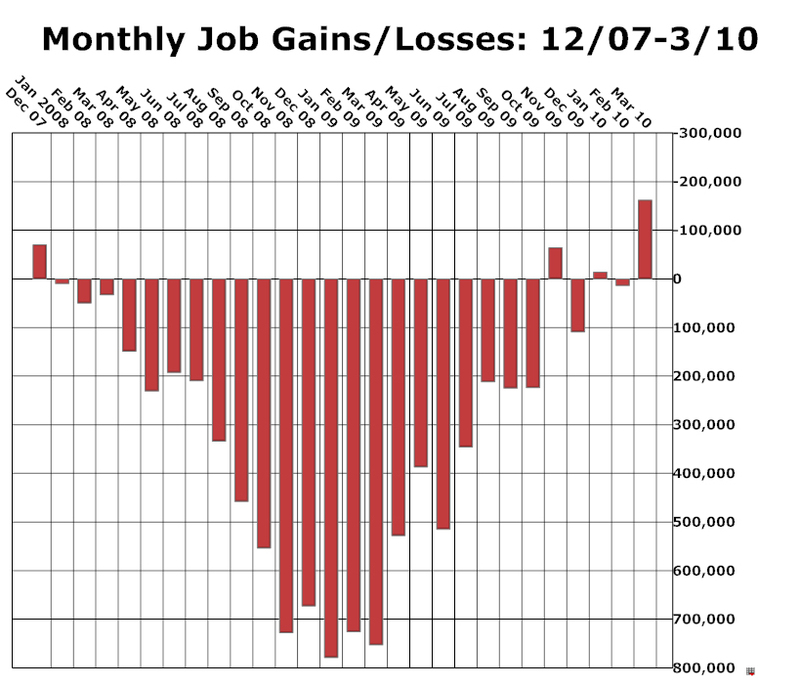 This isn't the partisan red/blue chart float around out there, but the current President obviously took office towards the end of January 09. I just don't understand this President! Giving shout outs to people like John Spratt and Larry Kissell that vote against him 4 percent of the time! Doesn't the President read BlueNC and get what Dan Besse is trying to do here? It's nothing short of a "progressive" revolution! Without the votes or the people, of course. God, my irrelevance makes my teeth hurt sometimes. This president is by temperament and preference a consensus builder. He will continue to try to work with people who have driven other less patient souls to outrage. An example of that is clearly Rep. Kissell, who has boldly and unapologetically opposed both of President Obama's signature domestic policy initiatives--clean energy/climate legislation, and historic health care reform. You may refer to those as mere 4% differences, Mr. Hudson, but be assured that their significance is larger. That's a reality that Rep. Kissell also failed to understand. I take issue with your characterization of these efforts as "progressive revolution". As Obama has repeatedly pointed out, the health care legislation in particular was a very moderate, centrist, compromise approach to addressing our most severe chronic domestic policy failing. In my view, only those who represented the true extremes of the American polity--or who were deceived or politically intimidated by their rhetoric--failed to recognize that. I believe that Rep. Kissell fell into that last category, and as such represented a major disappointment to the many North Carolina Democrats who had hoped for more from him. As you have observed, my personal patience has a lower saturation point than the President's. It was exceeded in this case. While I respect and understand Obama's continuing effort to work across the lines, others simultaneously need to speak more bluntly, if we are to hope for better from folks like Rep. Kissell in the future. And you're Lt. Gov. of what? If you want to debate someone's position on issues, that's not only fine, it's welcome. But ad hominem attacks are not. That admonition is coming from someone who contributed to the Kissel campaign on three separate occasions, and is being typed on a lap-top. They live in the 8th District. Let me ask again: Are you still Rep. Kissell's Communication Director (or otherwise associated with his campaign or Congressional office)? I ask because if so, then you should be in a position to answer my other question regarding why his defenders on this site have appeared to take special exception to my criticism of his stance. If my residence outside the 8th District is the key, then may I assume that he will be debating this point instead with his primary challenger, Nancy Shakir of Fayetteville? She does live in the 8th District. And before you ask, I have no connection to the Shakir campaign. Just an 8th District voter. If you can't say the same, I suggest you crawl back into obscurity on this subject Mr. whatever your name was. The funny thing is, I voted for you. Now go away. I will pass on the attempts at humor. Would you care to discuss the substance of Rep. Kissell's positions? where my constituents generally support my positions on city issues. Incidentally, I'm considered one of the moderate Democrats on the city council here. If you're not interested in discussing the substance of Rep. Kissell's stances against climate change and health care reform legislation, then I'll wish you a pleasant holiday and close the conversation. Wow, a moderate you say? Never took Dan Besse for one of those! I mean he comes on BlueNC every chance he gets to attack the only 96 percent liberal from another District he doesn't even live in doesn't he? God speed Dan Besse. You Winston-Salem Moderate-you. Stay "moderate" my Brother. And keep making NPR look exciting when you talk - everywhere but here where you play uncompromising "liberal." that you've raised my curiousity on one point. With all the criticism he's received from people inside his district and out, on his opposition to health care reform, I'm puzzled regarding why Rep. Kissell's defenders on this site have seemed particularly burned by mine. Can you enlighten me on that point? are you still Rep. Kissell's Communications Director? Or was that only during the 2008 campaign? I did not agree with Larry Kessel's position on the final Health Care vote and I did not like the US Chamber of Commerce "pressure ad series" on that topic in the Charlotte TV market. I e-mailed Larry my feelings and concerns. However, while you have lectured, at length, about how unwise it is to run for a federal office without a build up of elective experience now here you are vocally and actively supporting a candidate with no elective experience against a, now seasoned, Democrat encumbent who has not toed your imaginary line. Would you really rather put an amateur, or more likely a Republican, in Larry's seat? I supported Larry what I could financially in 2006 and plan to again in 2010. I am one of those who believe you elect the person to apply his best judgement. While I don't agree with Larry's vote on health care I am still firmly on his side. No, I was not on his campaign team and he has never given more than moral support to me politically. However, he was the only person in the party that sent me a note congradulating me for my 2007/2008 efforts in the Tenth District. I have taken no position on the 8th District primary contest. I certainly have no connection to Ms. Shakir's campaign. As Mr. Hudson has taken pains to point out, I don't even live in the 8th District. In the case of Rep. Kissell's stance against health care reform, I had frankly dropped it as something which I was personally discussing here. There seemed to be no point in re-hashing a done deal. That's why I was puzzled today when Mr. Hudson attacked me out of the blue on that point. Has Rep. Kissell's campaign suddenly developed concern over the primary challenge? I'd been under the impression that they were pretty sanguine over that, and that his polls looked fairly good for the fall. I don't even have to look that word up to know how irrelevant you are. Have a nice day Lt. Governor. I'm all for open and honest debate. Even heated debate. Even every once in a while putting your foot in your mouth during the heat of passion debate. But this stuff is just getting out of hand. While Dan Besse is more than capable of defending himself, let me just step in to say that Dan has said absolutely nothing out of line regarding Kissell and/or Kissell's health care vote. Best I recall Dan tried to open a dialogue with Kissell to discuss the issue. I do not know the people who are attacking Dan here in a very personal manner, maybe some of them speak for the Kissell campaign and maybe they don't, but they are not making themselves nor the Congressman look good here. Finally, Dan didn't even start this thread. You have basically walked into someone's house and started insulting their guests.